The available properties are mostly villas for sale in Arabian Ranches featuring a wide range of choices that vary in size, location, price, and many other specifications. Arabian Ranches is a large scale real estate project that gathers a number of residential communities featuring mostly villas. It has also a number of recreational areas and facilities to make living there very attractive. The project is famous for its equestrian and golfing facilities that draws visitors from all around GCC region. Arabian Ranches is a desert-themed project that boast unique architecture designs surrounded by expanses of greeneries and landscapes. The villas scatter across many parks, promenades, and playgrounds to offer large and relaxing ambience for its residents. Arabian Ranches is developed by Emaar, one of the largest real estate investment and development companies in UAE and Middle East. It’s a freehold area granting foreigners the full right to purchase and hold properties. Arabian Ranches is a gated community that sprawls over 1,650 acres. 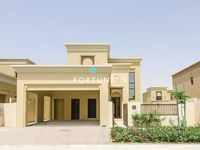 For all those considering buying a top-end property in Dubai, they should consider checking the displayed villas for sale in Arabian Ranches project. There is a massive collection of units varying in size between three- four-, five-, and six-bedroom apartments offering modern designs and fantastic set of amenities. The project boasts its residents a town hall, retail center, a set of restaurants, cafes, public parks, and a large golf course. Bit detached from the city’s bustle, the project lies bit deep into the desert to offer relaxing and tranquil ambience. The splendor of Arabian Ranches lies also in its extended greeneries and tree-lined streets forming an unrivalled residential society in UAE. The project lies on Sheikh Mohammed bin Zayed Road between the Global Village and Dubai Autodrome. 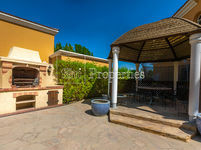 The villas available for sale in Arabian Ranches are arranged in clusters and communities. There are Alvorados, Alma Townhomes, Al Mahra, Al Reem, Hattan Villas, La Avienda, Mirador, Mirador La Coleccion, Palmera, Saheel, and many other. These communities compete in offering the best style of living. They have magnificent design patterns depicting modern building styles in addition to a wide set of amenities including parks, retail centers, recreational venues, swimming pools, and other. The villa range in space from three-bedroom, to seven-bedroom villas. The uniqueness of Arabian Ranches lies in it perfection. A centrally-located complex of residential communities offering a high-end quality of living, it lies near many of Dubai’s top touristic places like Dubai Mall, Mall of the Emirates, Ibn Battuta Mall, and other. It’s like a green oasis in the middle of the desert. 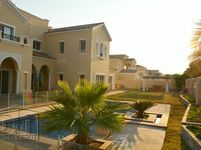 The selection of villas available for sale on Just Property were picked by top real estate agencies that have been engaged in this kind of business for years. Just Property choses to deal only with credible vendors who enjoy very positive reputation. The villas are listed in an easy manner to help users find what they are looking for without any hassle. The contact details of the property lister is accessible for all users, just check and call the number anytime around the day, you’ll find a professional property consultant getting your queries.